Tom slouched wearily down the hall and to the door of his bunk. His body was still trying to understand its new way of energy management, namely in caloric terms. So much more coming in, and so much more going out than he was used to. It would come in time as that foreign substance known as muscle started to make an appearance behind the loose skin of former survival living. But tonight? Tonight was for slouching into bed. Back on the ranch, before wars and street living, there was plenty of work—good and hard work. So it wasn't a completely unknown concept. But work was always done in a sort of ad hoc kind of way, what the wasi'chu called "open work ethic" (although they often called it that with derision). You just did work when it needed to be done. There was no guilt in conserving energy. Taking naps. Recreation. Idle hands became the devil's plaything back on Earth-That-Was when the devil first showed up on traditional Injun land. But Tom had learned, and learned quickly, when he joined the Independent Army, how to work the wasi'chu way. He was tired, but he felt good about it. Another day's earning keep for Jessa and himself. Made him stand upright when he oughta fall down. And that was another thing that was new to his body—a little self-worth—that kept him upright these days. He'd get used to it, but hopefully never forgetful of it neither. By the time he arrived at the door, he was blinking heavily. He reached down for the latch and gave it a tug. It slid open. He took one bootstep in before he heard the *ping*. From above the door, a stiff wire pivoted down, propelled half by the ship's artificial gravity and half by some spring-loaded mechanism. At the end of the wire was a big plastic mat. The entire thing resembled an old Earth-That-Was flyswatter. And it smacked Tom so hard in the face, he tumbled back out of the doorway, lost his footing, and landed on his rear end. "OW!" Tom bellowed. "Tian Fan Di Fu! Jessa? What in the Three Hills...?" "You didn't do the secret knock," came the voice from somewhere. Tom struggled to get himself into a more vertical position. Horizontal was nice, but he had wished it was in a way a mite more comfortable. "Wha—?" "You know. The secret knock." "Jessa, you gotta stop making these booby traps. Especially in my room. Someone's gonna trip one of them these days who ain't all understanding like me. I'm not ready to get ourselfs thrown off this boat yet, dong ma?" There was a giggle from somewhere inside. "Get up, you big goof." "I's serious, Little wāpos," Tom replied as he managed to get halfway to his goal of "up". The responding giggle was feedback enough that his attempt at stern parenting wasn't working. "You're trying to sound like that old wasi'chu headmistress at the orphanage. It's a color that don't suit you too well." Somehow Tom found himself fully inside the room. He took one more glance up and down the hall, then mumbled a little prayer to the Mouse Spirit that they hadn't caused...that he hadn't caused...a big ruckus to wake folk up that were already asleep in some fashion if they weren’t all up in the galley still eating or playing one of their board games. Or maybe he was just being overly sensitive, he thought, trying to make a good impression as the new additions. He stood and examined the slapper. His examination turned to admiration. "Gotta say, you are efficient. You always took the most unassuming spare parts and made them work for ya." "Thanks!" Tom paused and looked around the room. His nose wrinkled. "Jessa? Where are you?" The giggle from above made him look up. He rolled his eyes. "Get out of that ventilation shaft. I jus' been cleaning out something that I'd rather soon forget. Don' wanna clean up your bunk after today. An' if the captain comes down for inspection..." "Aw. You're no fun anymore." Tom shot a glance up at where the sound bubbled out of the grating. "An' yer a pain in the Pi Gu, Little wāpos." The grate popped open and Jessa bounced onto the floor. Tom admired the gracefulness of her movement. Very catlike. Must've been the strays she used to come across back in those Persephone alleyways rubbed off on her somehow. "Did you have a hard day? You're cranky." Tom sighed and sat down to take off his boots. He luxuriated at his feet's freedom he never knew he needed. "Just tired. Wouldn't say 'hard' though. You an' I we know hard. This is..." He blinked hard again. "Right, goofball. My turn to order you around like that old witch." She stood up and pointed her hand at Tom's hammock. "You shall say your prayers and proceed immediately under the covers, arms above the sheets so I can see them," she said with a mocking Russian accent. Tom stood, hands folded, "Dear Buddha. Please bring me a rocket ship, and a pony, and..." "Wou Duh Tian Ah! How hard did my trap hit you?" She giggled again. "Alright. Off to sleep. No reading, unless it's the Bible. An' not that bad Bible, the good one." Tom saluted. "Yes, ma'am." He climbed into his hammock. Réncí de fú, it felt good to finally do so. He looked over the edge at her. "Listen, have t' say, been workin' hard t' keep us fed an' sheltered here today, so I'm mighty tired. 'Bout two blinks away from unconscious. Best y'all head on back t' yer own bunk. Reckon boss lady'll want us both doin' duty an' earnin' keep." Jessa kicked at the floor like she often did when she wanted to stall. "Tom?" "Yes, wāpos?" "Can I sleep here tonight?" Her voice had gone several notes into serious. He sighed. "Still getting used to being enclosed in a ship instead of out in the open sky?" "Yeah. It's like someone's constantly flapping their hands in front of my ears. All echoey an' stuff. Makes it hard to sleep sometimes." "Yeah. Me too, nizhoni. Me too." After a moment of silence. Tom could hear Jessa sit down on the bed. "Tell me a story." "A story?" "Yeah. Like you used to. A bedtime story." "Alright. Just one. Then off you go, 'kay? Which one you wanna hear?" "How about the one about the Grumpy Old Grizzly Bear. You know, the one that worked all day and came into his den to find a little bunny." Tom chuckled. "I don't know that part of it yet. But... I'm eager to see how it ends." "Me too, goofyhead. Me too." "Alright. The Grumpy Old Grizzly Bear. Way back on Earth-That-Was, Grizzly had just spent a long autumn eating lots of berries and getting fēngmǎn fat. He had looked all day for a nice den to sleep for the winter, when..." It wasn't long before the soft snores came. First from one. Then the other. “Complete disarray or sheer pandemonium”, lit. "sky tumbles while earth turns over." “non-Native,” [Sioux] lit. “White Chief” but took on derogatory connotation post-Contact; akin to Yiddish “goy”. 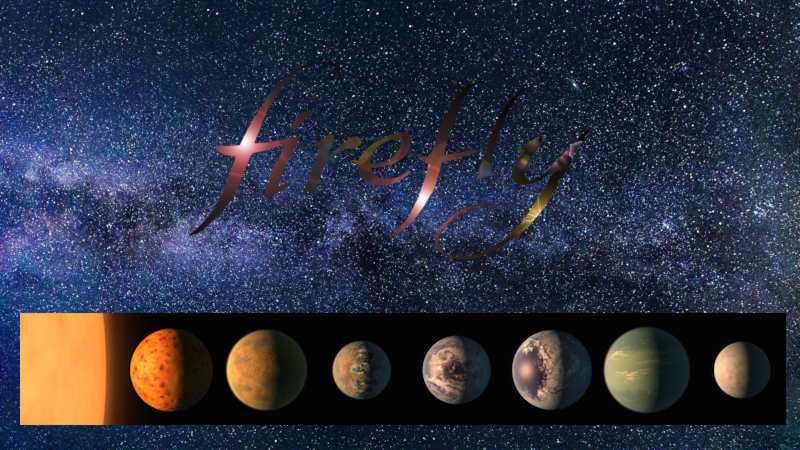 In the Firefly ‘Verse, it has become the common slang among indigenous origin people to refer to whites, but also to those of Chinese culture, particularly Core culture.